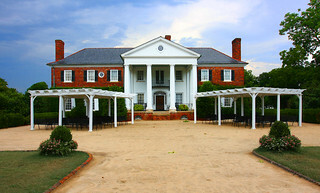 This home was the primary residents for the mini-series North and South. Although the plantation it sits on is original as are the slave cabins, this home was actually built in the 1930s. Plantation homes in South Carolina tended to be built from wood and were not nearly as elaborate as this one.. However, Boone Hall Plantatin is worth visiting just to see the original slave cabins, among the very few still standing in the United States.